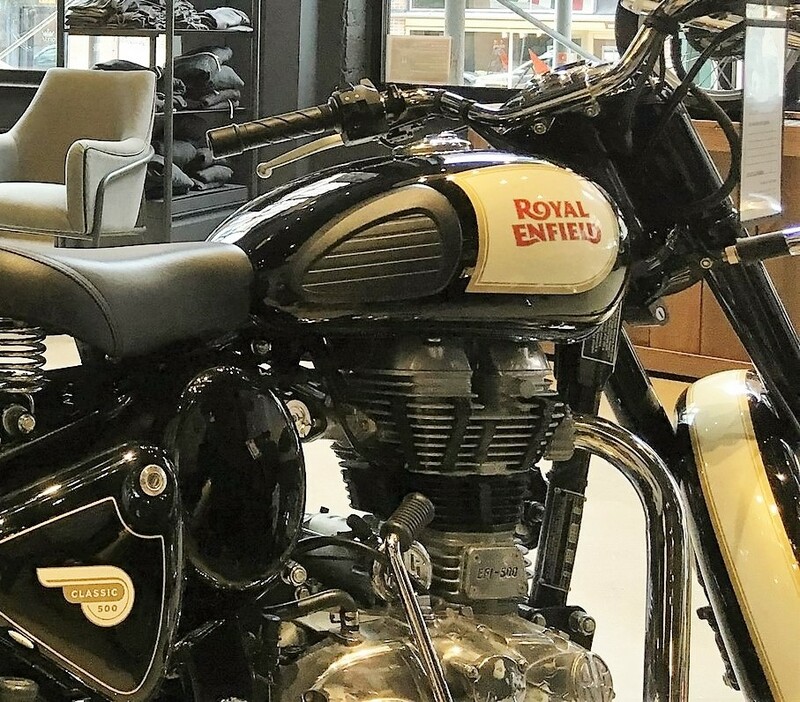 Royal Enfield, the world’s oldest continuously operating motorcycle brand, is settling into its new North American headquarters in Milwaukee, Wisconsin, after a grand opening September 10. Located in a former leather-goods factory on the high street in the city’s trendy warehouse district, the classic British brand hopes to sell tradition from the hometown of that other traditional motorcycle manufacturer, Harley-Davidson. Royal Enfield produced motorcycles in Britain from 1901 to 1970 before moving to its current factory in Chennai, India. The longest-running Bullet model harkens back to 1932, and its tank and panels are still hand-pinstriped as they were then. Aesthetically true to their roots, the single-cylinder motorcycles now feature such 21st Century upgrades as electronic fuel injection, twin-spark ignition and electric start. Adjacent to the new corporate offices is a flagship dealership which trades upon the urbane, British Raj-chic projected by Royal Enfield. It showcases the heirloom qualities of an old-world British motorcycle with the sensibilities of the globalized, brand-conscious millennial consumer. Are the entry-level priced, mid-sized retro bikes aimed squarely at young urban hipsters? Enfield’s North American Marketing Manager Bree Poland bristles at that pigeonhole. “I think the bikes have broad appeal, whether to a beginner rider or a seasoned, classic-bike enthusiast looking for a pure-riding experience,” Poland said. In 1964, Royal Enfield introduced its 250cc Continental GT. It was the largest-displacement bike you could ride in the U.K. without passing a driver’s exam, which made it an instant success with the burgeoning youth café culture. Shrewd marketing by Enfield put racer John Cooper aboard one on a 20-hour tip-to-tail sprint across Great Britain, laying claim to the class speed record and making the GT iconic to a generation of British motorcyclists. The new 535cc Continental GT is a faithful update of the original, but with Brembo disc brakes, Paioli shocks and a lightened flywheel. The most-powerful and most-expensive motorcycle in the Royal Enfield lineup at $5,999 MSRP, the GT price tag leaves plenty of room for further personalization through an array of accessories and options sold by the company and aftermarket. But Royal Enfield is not just looking backward. It has hired 75 engineers in the past year to develop new products at its two recently initiated design facilities in England and India. One such endeavor is the Himalayan, a dual-sport, go-anywhere bike which takes its name and inspiration from the Nepalese tour guides which have famously ridden Enfields for years. While there are some test bikes for the media in the U.S., the tentative plan is to bring them here in mid-2017. 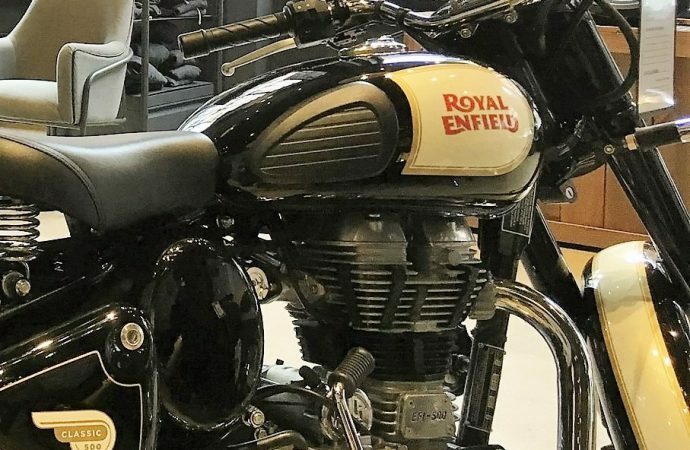 Enfield’s formula seems sound: take all that is good about classic British motorcycles (great history, charisma and style) and leave all the bad behind (fussy carburetors, leaky cases and wispy electrics). Each bike still is equipped with a kick starter – for those uber-cool startup moments in front of your friends at the café – and an electric starter for when they’re not looking.